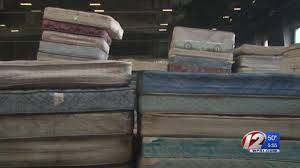 GALION — Galion’s health department will conduct a mattress and tire collection day on Saturday, Oct. 20, from 11 a.m. to 3 p.m. Ohio EPA grant funds will allow the health department to collect up to 100 mattresses/box springs and 553 passenger tires. This collection event is for Galion residents only, and no commercial entities will be permitted. The collection site is the parking lot across from the Fire Department, on Liberty Street. Fore more information, call the health department at 419-468-1075.